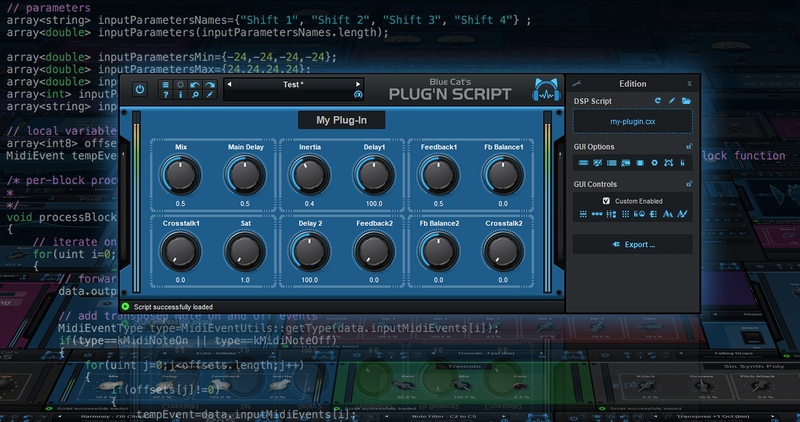 Paris, France, 2018/11/30: Blue Cat Audio has released an update for Blue Cat's Plug'n Script, their scripting software that can be programmed to create custom audio and MIDI effects or virtual instruments inside most Digital Audio Workstations (DAW). VST3 or Audio Unit plug-ins. The update also brings multiple improvements to Plug'n Script as well as exported plug-ins (full list below). The update is free for registered customers and can be downloaded from the same location as the original full version (link received by email upon purchase). A special introduction price (20% off the plug-in) is available to new customers until December 15th. Demo versions can be downloaded for Mac and PC.